As I procrastinate with my finals, I think about the summer that awaits me. Despite my concerns of finding an internship for the summer, I am fully content on residing at home for this one, and picking up whatever work I find there. The next year awaits my preparation, and I would like to take it seriously in the next coming months. Autumn is specifically awaiting my movie plans, because I will be directing my first film then. It also may be my only one during college, so I desire it to be something extra special. Next school year also means my hopeful return to competing in track and field. My academic schedule has blown up this past year, sending me on hiatus for months. And that scheduling trend shows no signs of dieing down for the next school year, which places more importance on what kind of shape I can get myself into during this summer season. Since it looks like I will be home once again, I've begun to reminisce the old routes I ran while in high school, and am now eager to get back to them. But I'm still not even in-shape enough for that! I hope the first weeks of exhaustion and soreness go by without injury, so that I can sail smoothly along the old trails for the remainder of the summer. So what does all of this mean for you, the reader? I'm not one to update anyone on what I'm doing constantly... hence, my blog title: "Excerpts". Excerpts, to me, are stories. I love stories, which is evident in the educational path I am taking in filmmaking. So I'd only like to tell stories, instead of just updates on what happened to me. Within my entries you will read about my ideas, and sometimes how I have acted upon them. And because I will be working on my script, I may be looking for input! All comments will be responded to. I will not naively promise an entry a day. That concept makes no sense to me. Who wants to read some dribble that was squeezed out? I will promise an entry whenever I have a story to tell you, or an idea to share. I expect more stories from my training, and more ideas from my pre-production for the movie. 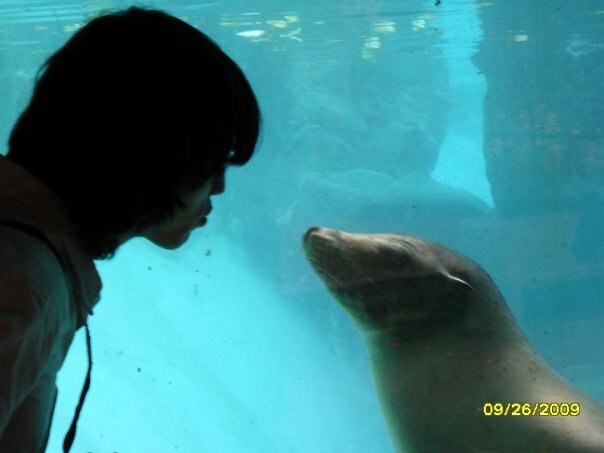 And with that, I will grant you a picture of me trying to kiss a sea lion.